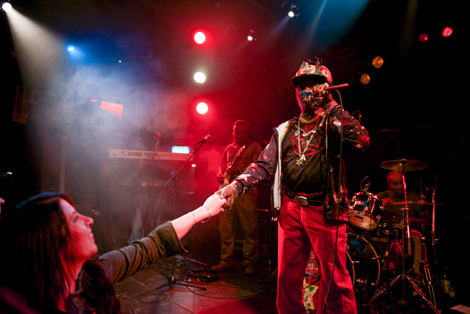 Indiscernible yet unstoppable, the Lee Scratch Perry experience proves an inspiration one again, Getintothis’ Sean Bradbury is caught up in the blissfully addled mania. Rainford Hugh Perry and Robert Allen Zimmerman. Both in their seventies, both pioneers in their very different fields and both still to be found on a Never Ending Tour. 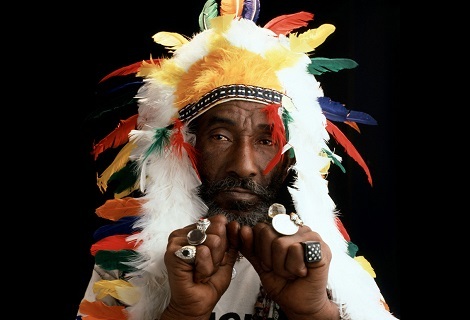 Like Bob Dylan, you expect Lee Scratch Perry will be Freewheelin‘ forever and that the gigs will only stop when he does. Like hearing Dylan live, there is a sense he is now covering his own music as his stream of consciousness lyrics flow in and out of songs with the unpredictable will and intent of a defective supermarket trolley (or perhaps a Rolling Stone), moments of clarity emerging here and there with a chorus or refrain. And again – not unlike Dylan – here is an audience hanging on his words, if struggling to understand them at times. 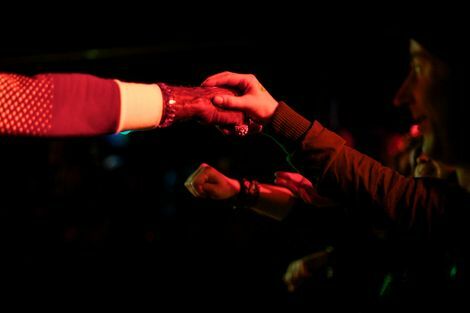 But none of this really matters. Comparisons to what Scratch might have been before are largely spurious when watching him perform, as it is near impossible not to become caught up in the blissfully addled mania. Which begins – as maybe everything should – with a dub Hokey Cokey, as the crowd are implored to shake their heads, legs and whatever else comes to mind while Scratch hops up and down pointing to various body parts. 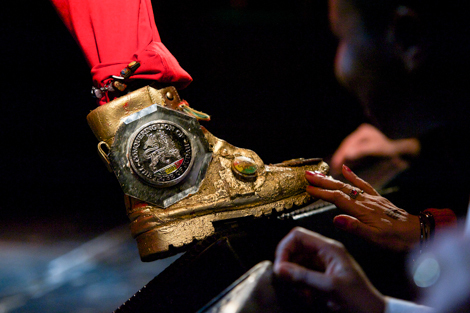 He takes to the front of the stage and allows his keenest fans to get up close and personal with his golden trainers during a delightful, dubby take on Sun Is Shining, and reveals a severe and purple haircut when removing his hat – adorned with a myriad of mirrors and trinkets – in the midst of One Drop. 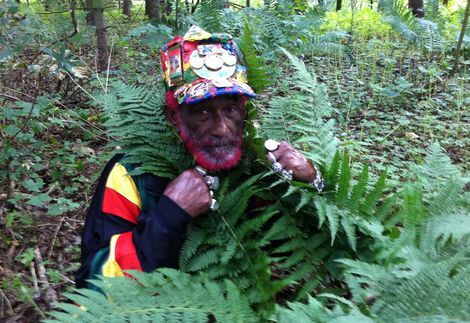 He emerges later in Scratch Force One fatigues, looking like he is off to pilot a plane all the way to Jamaica at the end of the night. 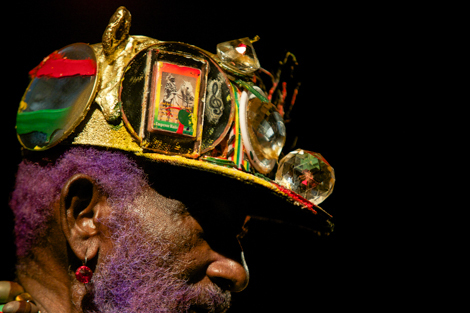 As the outfit might imply he launches into strains of I Am a Madman, before setting off a skank with Rastafari Live. The set finishes with a startlingly funky, dubbed-up version of Exodus. It spans far and wide and covers more books of the Bible than the original, as Perry proclaims: “Genesis, Revelation, Chinese, Japanese“. Bizarre, bright red and brilliant. 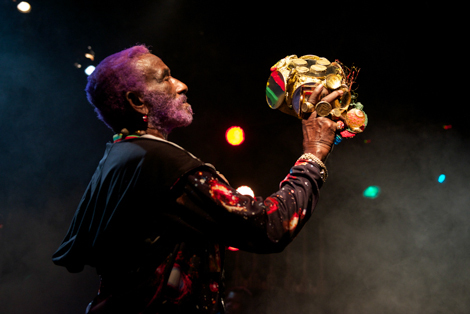 Long may Lee Scratch Perry keep blowing in the wind.